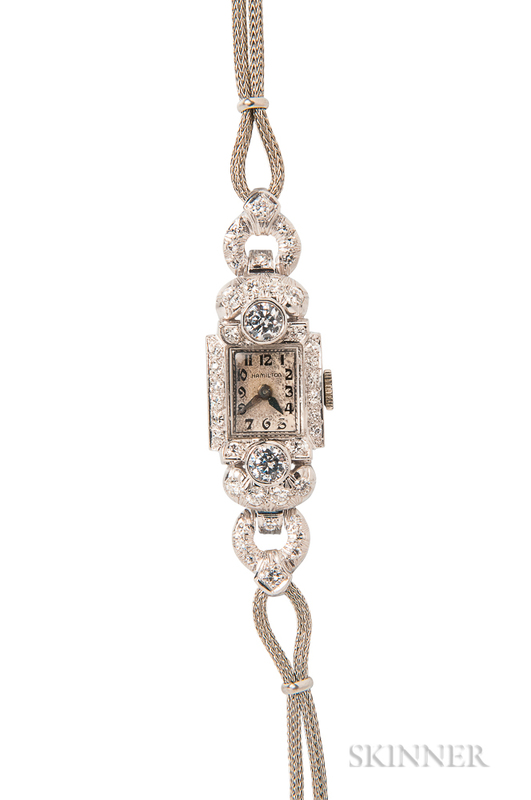 Art Deco Platinum and Diamond Wristwatch, Hamilton, the ivory-tone dial with arabic numeral indicators, manual-wind movement, set with bezel-set cubic zirconia, and single-cut diamonds, joined to later white metal strap, lg. 7 1/2 in. Larger stones are cubic zirconia. Platinum and Diamond "Diamonds by the Yard" Necklace, Elsa Peretti, Tiffany & Co.
18kt Gold and Peridot Necklace, Tiffany & Co.
18kt Gold and Citrine Necklace, Tiffany & Co.